Pink and blue...always a winning combination for me. Cheery and bright, I often opt for this pairing when I try to make my outfits a bit more striking and interesting. Though normally, I prefere to wear pink and blue with darker hues like navy or even black, for today's look I went with something a bit lighter. Aside from the fact that I am utterly obsessed with these Zara pants because they are a perfect hybrid between masculine and slim fit, I rather like the way the grey and the dusty pink complement each other for a slightly more feminine, not-so-very-girly vibe. 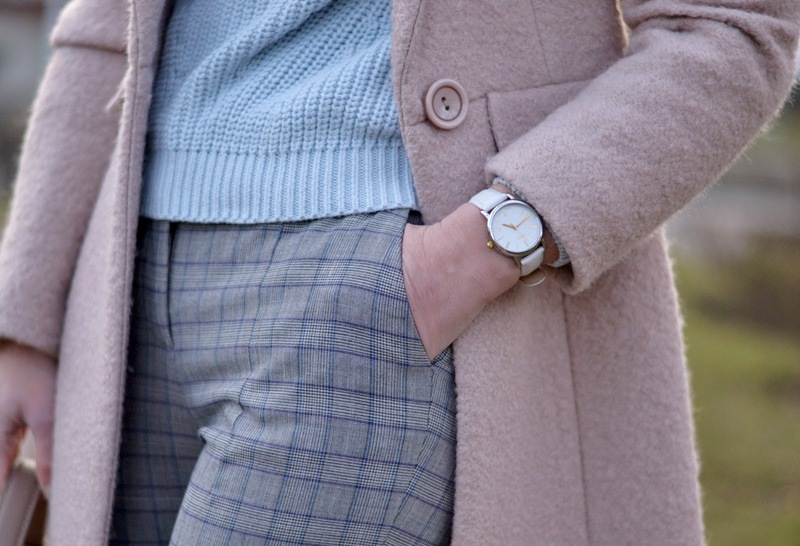 A pink coat is a stylish way to add a feminine touch to an otherwise masculine outfit. It looks great with pastels, jewel tones, primary colors and neutrals. Regarding the shape, the candy inspired coats are often on the chunky side, so its nice to balance with fitted cigarette pants and a shirt that covers the neck without creating volume. Note that the shape of the coat itself plays a role: not girly at all! It has a rather masculine vibe. Add baby blue, because that matches pink sooo well, plus neutrals for accessories and tadaaa! You've got yourself a masculine-feminine office look to wear this winter. Or spring!